Discussion in 'Computer Monitor Forum' started by wavetrex, Aug 29, 2017. Yes, aware of that, but @3840x1080, it's literally half the stress of 4K on my GPU's, hence I can max out all ingame setting. Plus, I like the super UW view the monitor afford. They announced a new 1440p version as far as I’m aware. After seeing the higher resolution, I wouldn’t want to go back to anything 1080p anymore. The stress is severe though. Regardless, I went ahead and bought it, should have it by tomorrow....free delivery as it's too big to fit into a regular car. The shop that I'd bought the monitor from did an early delivery, I didn't even clear up my 21:9 monitor space on my desk. 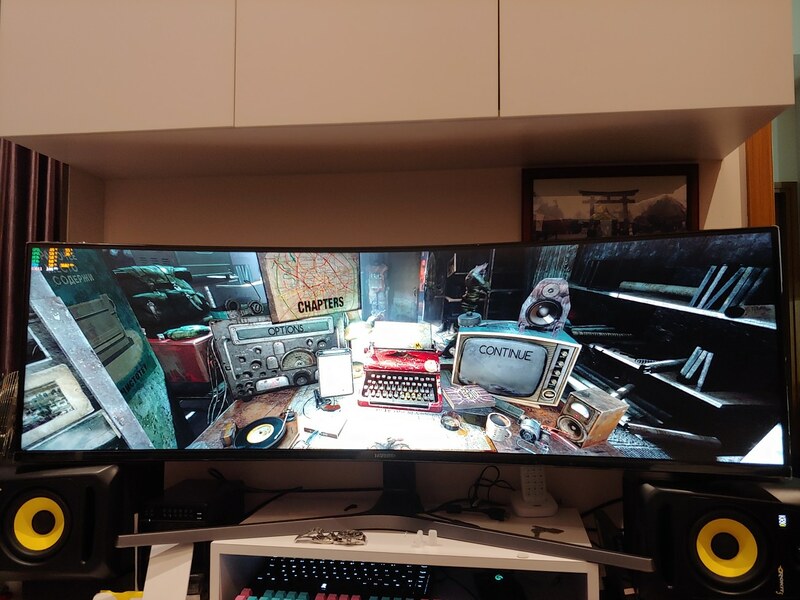 Pardon my messy desk, I wasn't prepared for them to deliver the monitor today....looks great though, I had Metro 2033 Redux running just to show the sheer amount of screen real estate. quantum hacker, Rich_Guy, The1 and 1 other person like this. I was considering the Samsung 49 incher. but after looking at the images height on these monitors, it seems like some of the image on top and bottom seems cut away. Width is amazing. But the height seems to squish the image. And it seems like there is top and bottom image loss. Anyway, I have my RTX 2080 Ti hooked up to my Acer XR341CK when I wanna play fast paced action FPS like Serious Sam series, UT series....so, I ain't gonna miss out on anything. 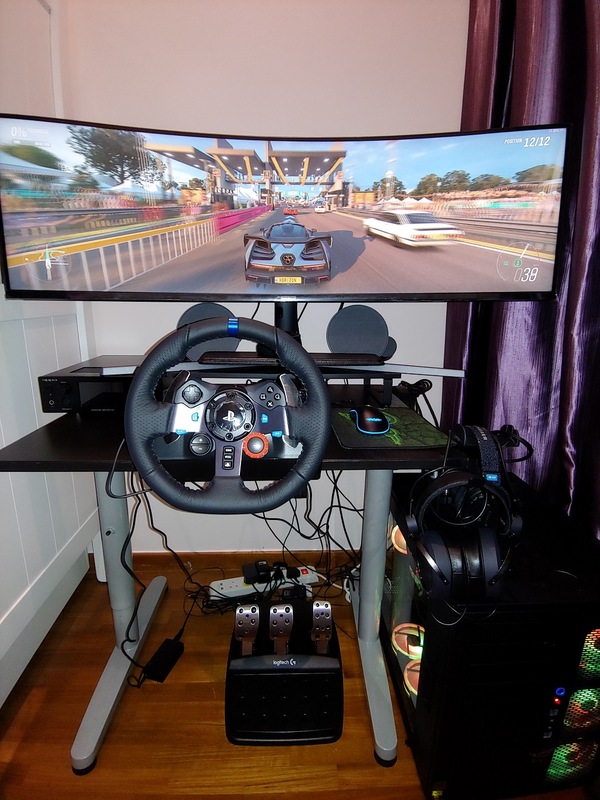 Since this super ultra wide monitor's build for racing games (due to its aspect artio), I'd gotten a Logitech G29 steering wheel and pedal. Pic below is a rough initial setup, will manage the cables later, right now, more concerned about the sensitivity of the steering wheel, I'll have to adjust it. 0blivious, Rich_Guy and The1 like this. Hey folks, I could use some advice. 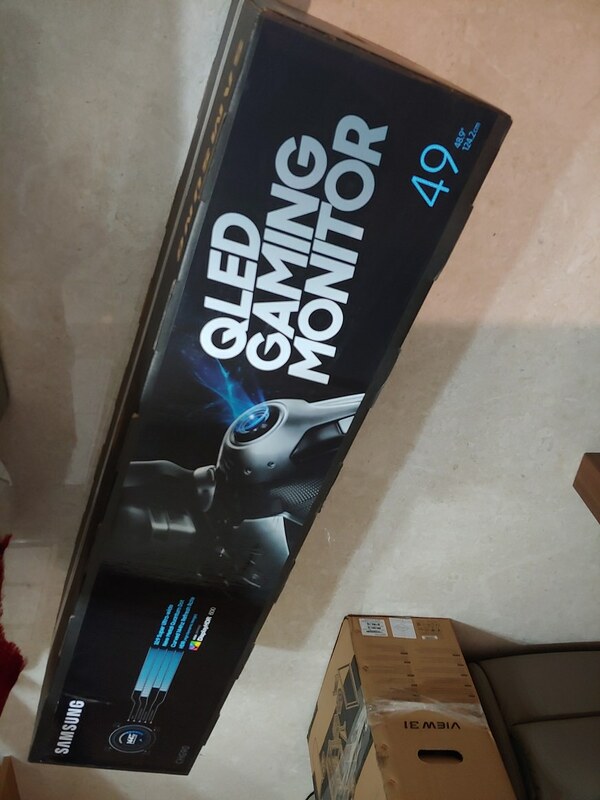 I'm looking to get a 34" QHD UltraWide. The thing is, I want to go VA instead of IPS. I've had both types in the past, and for my gaming use case (exclusively at night, in a dark room), the deeper blacks of a VA panel are of greater benefit to me than the more vivid colors of IPS panels. Can anyone think of another VA panel I should consider? If so, please let me know. I'm looking to pull the trigger around the first of the year. There might be something faster now, but it’s still a great monitor. I can recommend the AOC AG352UCG6, it's not under $700 (I think amazon has it for $800 normally) but it's cheaper than others with equivalent specs and it is a nice VA panel. Compared to the Acer one you linked it has the advantage of gsync and an extra 20Hz refresh rate. If your profile is lying and you have an AMD gpu then yea go for freesync, but otherwise if you care about adaptive sync you're stuck with the extra cost for gsync. I do have 970 SLI, but I'm not really concerned with FreeSync/G-Sync. Currently, I run all games at 60fps with V-Sync on because I like consistency. I'm only playing single-player and co-op stuff, so I don't need the competitive advantage of additional reaction time. The 100hz of all these panels should be more than enough for me. This was supposed to be released this year. Vaporwhere so far. Well, wait's nearly over....LG will be releasing 5120x1440 monitor pretty soon. I hope 3440x1440 gets more affordable later. I don't mind going back to AMD for Freesync if the RX 3080 is going to be faster or equal as RTX 2070. My current Acer Z35 is good enough for me, even with tho's big flaws it has. That’s why I’m fine with 100Hz. With my typical eye candy, I couldn't drive 144 anyhow. Hey man, you still digging that ultrawide?! Thanks to NVIDIA, my monitor just gotceven better. GSync works fine, even with an extended range from 24-100Hz. Now I’ll judt need to find out why everything has to be windowed/borderless for it to work, but as performance is still good, I won’t need to hurry.